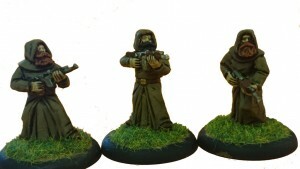 EMP Games has their new Battle Brothers minis available over in their webshop. The Battle Brothers are finally here to aid there Sisters, though the nuns do seem like they have been taking care of themselves. The Brothers are armed with an AK47 type weapon. Perfect for spraying bullets in all directions. There are 2 packs of 3 figures @ £4.50 per pack. All 6 figures are slightly different.